Product #21809 | SKU NE8MC6-MO | 0.0 (no ratings yet) Thanks for your rating! 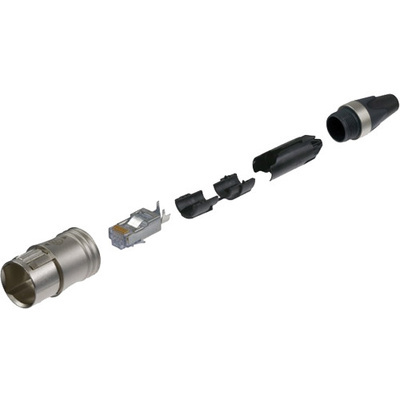 The Neutrik NE8MC6-MO etherCON CAT6 Cable Connector Set includes a cable plug carrier offering a robust metal shell with a Push-Pull locking system, proven Neutrik chuck-type strain relief, and a CAT6 RJ45 plug. The set can accommodate STP und UTP cables with an O.D ranging from 0.21 to 0.25” (5.5 to 6.5mm) and a gauge of AWG 22 to 28 solid or stranded wire. This self-termination version is water protected according to IP65.